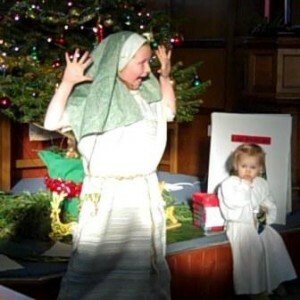 A funny nativity play that every one can enjoy! This script is perfect for primary school or church nativity plays, and is especially ideal for mixed age casts, small casts and older children ….in fact, for ALL GROUPS of ANY SIZE and ANY AGE. “It was great fun! We all had such a laugh! Rochelle Samwell: Glandore Family Church Kids Club in Adelaide, Australia. simple to use regardless of the number of children. INSTANTLY DOWNLOADABLE in an easy to use format. The Day That Baby Jesus Came to Town nativity script lasts around 25 minutes and is written entirely in rhyme, including the narration and all of the speaking parts, a proven way to make the script easier to remember. Baby Jesus Came To Town. The script lasts around 25 minutes, and tells the traditional bible based nativity story in a fun way using characters with lots of humour, attitude and sarcasm, and carried by narration plus lots of small speaking parts all in rhyme. Click here for a preview of the script. This script tells the nativity story, all in rhyme and rhythm, from the perspective of the gossiping innkeeper’s wife who was so intrigued by the activity and visitors to their stable that she wrote it all down in her diary. A hilarious script throughout, older children and even teenagers particularly enjoy it as it……. Short, rhyming speaking parts (averaging 2 to 4 lines) to make everyone feel special. With a diary and a letter providing the means for the narrator, innkeeper and his wife (the main character) to read the narration. Does NOT require lines to be memorised as most can be read. This makes last minute changes much easier to accommodate. In case you do not have a pianist, mp3 backing tracks are included for the simple songs, in addition to the sheet music. If you’re ready to buy THE DAY THAT BABY JESUS CAME TO TOWN, click on the ADD TO CART button below, or continue reading if you need more details. Click here to see a script preview to show how flexible and adaptable this script is. THAT’S RIGHT…NO PIANIST REQUIRED, although sheet music is provided if you are fortunate enough to have one! 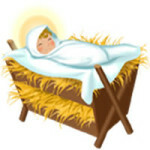 All of the songs for the Day That Baby Jesus Came to Town nativity play use familiar children’s tunes with very SIMPLE SONG WORDS to help to minimise rehearsals . I have used my own easily remembered words to the following popular tunes…. Finally, my own “Sleep Gentle Jesus” song. Sheet music is provided with the script but, for your convenience, I also include mp3 backing tracks in case you have no pianist, or for use during rehearsals. I would expect the script, including songs, to last approximately 25 minutes, although this will, of course, be reliant upon everything flowing in a calm, fully rehearsed way without delays to get actors in position etc. Of course, the songs are optional so you can reduce or lengthen the performance time by omitting or altering the songs. If you choose to include the “The Day That Baby Jesus Came to Town Roll Call” poem allow up to 2 minutes, but recognise that this poem is different in length dependant on how many of your cast stand and say their line and how speedily and efficiently they do so, and what pauses they take! The poem gives everyone in the cast the opportunity to bow and respond at the relevant point. If you choose to use the poem “Jesus is Not Just for Christmas” to round off the play allow another minute. Considerations when planning your rehearsals…..
Generally speaking the individual scenes can be rehearsed separately (innkeeper’s scene, shepherds scene, kings scene, etc) making it feasible to practise the scenes individually BUT the innkeeper’s wife and/ or narrator tends to be in each scene so they couldn’t be done at the same time! If you choose to use the songs, they are deliberately easy to remember as the words are simple and repetitive, but they can be practised without a pianist by using the mp3 backing tracks provided. Alternatively, the songs can be replaced with past favourite songs or appropriate carols for everyone to join in with, reducing/omitting the need for music rehearsals. If you would like to see examples of the traditional nativity costumes that we have used click here for some photographs. Just £9.95 for an instantly downloadable pdf document of the script, including sheet music and downloadable mp3 backing tracks of the music. Alternatively, I highly recommend upgrading your purchase for just £2 extra,to receive all of the above in addition to A WORD DOCUMENT of the script to customise and personalise for your own nativity play. It really is invaluable when it comes to personalising the script and distributing lines etc. Remember the reason why we celebrate Christmas: the birth of Jesus is not just a story, but the real reason for our celebrations at Christmas-time. The free bonus poem “Jesus is not just for Christmas” highlights the message that, whilst Christmas is a lovely time of celebration, we must remember that Jesus is the reason for it, but also that Jesus’s birth was a gift to us from God, not just for Christmas-time but forever. Having used this script myself I have put together some hints and tips which you might find useful, in which case click here for the benefit of my own experience of using the script. If you are ready to buy The Day That Baby Jesus Came to Town, click on the ADD TO CART button below, or continue reading if you need more details. So, how much does it cost, and what is included? 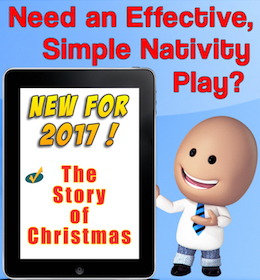 I pride myself in making my scripts the best value for money around, so The Day That Baby Jesus Came To Town nativity playscript, including sheet music and FREE music mp3 files, can be downloaded instantly to your computer for the special low price of just £9.95. Which is yours to customize as you choose once you have bought it, so that you can……..
Print off your finished version, exactly representing your own personal nativity plans, and distribute individual speaking parts for the children to learn. All without any untidy scribbles or mess on the pages, leaving it as clear and easy as possible to read and use! You can take advantage of this unprecedented option to upgrade and receive the actual, adaptable word document in addition to the PDF (you’d be mad not to) for just £2 extra. Just follow the simple instructions once you click the “ADD TO CART” button. Remember, it is a totally customizable Word Document IN ADDITION TO THE ORIGINAL PDF. The purpose written Day That Baby Jesus Came to Town, “Nativity Roll Call” performance poem: a fabulous and unique finale for any traditional nativity play. Again, all in rhyme, this gives everyone involved the opportunity to take a bow as they say their own individual line. This has been so well received that I now write one to work with each of my scripts. “Jesus is Not Just for Christmas” : A purpose written Christmas rhyming poem which can, if you choose, be read out to round up the message at the end of your nativity play. Grab your LICENCE FREE COPY of The Day That Baby Jesus Came to Town at the ……. You will then get the option to UPGRADE to the fully customizable Word Document package for just an extra £2. Maybe you’d prefer the traditional bible based nativity story told with lots of humour and adding a contemporary twist, again all in rhyme, including the narration which holds it all together. Would you prefer the combination of a modern day Christmas Eve setting anticipating Santa (or St Nicholas), alongside a reminder of the traditional bible based nativity introduced by Grandpa as a bedtime story (and acted out in rhyme), with a hint of pantomime villain in Herod? This script also includes sheet music and mp3 backing tracks for 5 songs. Like the sound of it? This script tells the traditional bible based story from the perspective of the donkey, feeling unnoticed and unremarkable until he realises by the end of the story that he had been chosen to carry God’s unborn son to the place of his birth, and that God had not only noticed him but had actually been with him all along and actually LOVES his humble life. Acted by a young child, the donkey can add a cute factor, or more of a comedic effect acted with attitude by an older child. The story is told with lots of gentle humour and short speaking parts, all held together with a rhyming narration and interspersed with 6 simple songs. Sound suitable for you? Do you need something even more Adaptable, Brilliantly Creative, Deliberately Easy and Flexible? Maybe, a script entirely narrated as an alphabet poem, with printable illustrated letters provided to be displayed at the appropriate moment, and actions suggested for all of the alphabetical keywords of the Christmas story, and no lines to learn. Something perfect for any cast, including special needs, or even pre-school children. Maybe you’d like some interaction with the audience and get them involved doing actions too? The concept of this script is so simple that you can accommodate any preference according to the ideas given throughout the rhyming script , which includes mp3 backing tracks and sheet music provided for 8 simple (optional) songs too. Do you want to incorporate your nativity play into a nativity service, and all join in with some uplifting carol singing? Do you want a simple but effective play, with the unique effect of rhyme in the storyteller’s part, as well as the actors’ lines. Maybe rehearsals are difficult to achieve, or you prefer a ‘less performed’ approach, or would simply like less focus on the perfection of the performance and more on the biblical teaching? How great would it be to have all of the appropriate bible readings included, not to mention all of the script prompt cards pre-prepared and ready to simply print off and distribute? Does a pre-prepared nativity service including the gentle innocence of a children’s nativity play, the joy of a good sing, and the teaching of the bible passages appeal to you? If so, click here to go to THAT WONDERFUL GOD-GIVEN FIRST CHRISTMAS DAY. Happy to use your own choice of songs/carols, or maybe to combine your nativity play with a church service and congregational hymns? If so, the price of the following options is EVEN LOWER!…. Why not let the narrator tell the entire story and give the cast instructions, all in rhyme via the script (making this possible to do without a rehearsal!)? There are 19 small optional speaking parts (each following obvious prompts such as “The innkeeper said…. ), plus lots of narration to share as you choose, as well as an instructor giving the instructions to the actors if you have any. Printable script cards are included (plus ‘name tags’ for if you have a director brave enough to do an impromptu nativity play without rehearsal!) If the actor doesn’t say it, the narrator does…. Do you fancy doing a simple nativity play? If so, click here to go to THE SIMPLEST NATIVITY PLAY EVER. The script, as it is written requires Mary, Joseph and an Innkeeper, but also has an additional 20 small optional speaking parts (each following obvious prompts such as “This is the angel who ………), plus 76 lines of narration, and 72 lines for the director (the director does not need to learn anything, but has the script on a clipboard and refers to it constantly as part of the director role, so he/she is able to scan read lines as if simply checking the script for the actors). Printable script cards are included (plus ‘name tags’ for actors to hang around their necks to aid the director, if you are brave enough to do an impromptu nativity play without rehearsal!) If any actors choose not to say their own lines, the script allows for a voice-over to say the lines on their behalf so that the script does not need reducing. If so, click here to go to THE STORY OF CHRISTMAS. This last script is very specific and written for a church service…. Do you have a fun, family atmosphere in your church? Older children? Not many children? Little opportunity to rehearse? 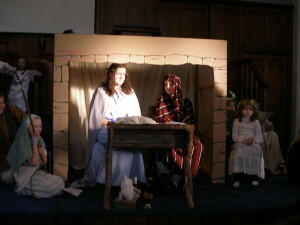 The hilarious and unique Do-It-Yourself Nativity Play invites people from the congregation to join in as the script progresses, all narrated and directed IN RHYME AND RHYTHM, and unashamedly mocking (via the script) the adult volunteers! Sound like fun? If so, click here to go to THE DIY NATIVITY PLAY. Still prefer The day That Baby Jesus Came to Town? At this price, where’s the harm in buying a couple and being prepared for next year too? You have my blessing to mix and match the songs (and even parts of the scripts if you like.) Adapt them as you choose, and the upgrade to the word document will make it even easier! Ps. If you are still not sure, remember that you don’t have to take my word for it. Read the fantastic testimonials that I have received, from teachers and nativity organisers who have used my scripts. PPs Still not sure? Click here and let the script previews speak for themselves. In the meantime why not TRY OUT MY WORK FOR FREE? Download your FREE COPY of my “Nativity Roll Call” rhyming poem which makes a fantastic finish to any traditional nativity play! Just enter your name and email address in the box below, click the “SEND IT NOW!” button and you will immediately be given the opportunity to download the Roll Call poem. Once you’ve seen how simple and instant the download process is, why not come back to purchase your instantly downloadable nativity play – you’ll be glad you did! PPPs. Why do I do it for this price? I love the work that you are doing! Let’s face it, you are doing endless extra hours and voluntary work, so this is my way of supporting you and saying that it is all worthwhile and appreciated. Well done, and keep up the good work! Enjoy the script, have fun with your nativity play, and have a wonderful Christmas!